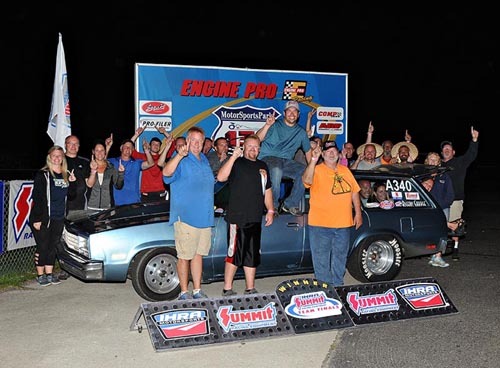 MARTIN, Mich. - US 131 Motorsports Park repeated as champions at the International Hot Rod Association (IHRA) Division 5 (Thunder) Team Finals held over the weekend at their home facility. 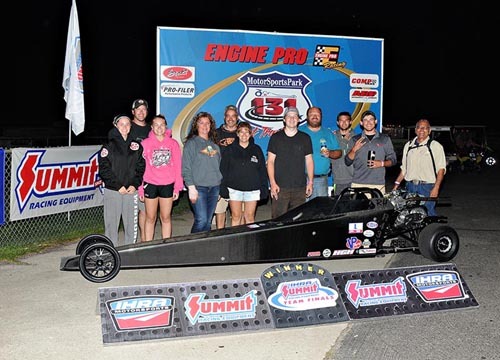 US 131 captured the team title 51-38 over Muncie Dragway which finished runner-up for a second straight year. The competition included some of the most iconic tracks in the Midwest and Canada. Top Marty McKinney (Muncie) won on a holeshot with a .003 reaction time to a .016 for Grant Zimmerman (Cordova). McKinney had a 6.35-second elapsed time at 105.16 mph against a 6.34 dial-in. McKinney matched his 6.42 dial-in and finished at 105.29 mph. Mod Donnie Hagar (US 131) had both the faster reaction time at .022 and matched his 6.40 dial-in on a 107.14 mph run. Rich Perdue (Ubly) was runner-up with a 6.02 second pass at 113.32 mph against a 6.03 dial-in. 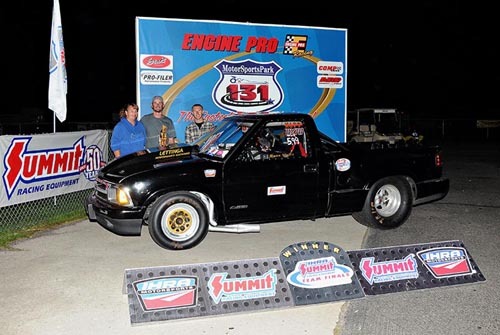 Street Steve Mesik (US 131) won with a .025 reaction time as Jordan Wilhelm (Muncie) red-lighted. Mesik had an 8.21-second run at 80.73 mph against an 8.20 dial-in. Wilhelm went down the track in 7.47 seconds at 90.05 mph against an 7.50 dial-in. Junior Dragster Evan Mulcher (US 131) had a .038 reaction time and added a 9.10-second pass at 69.09 mph. Mason Osborne (Great Lakes) finished runner-up with an 8.03-second run at 77.21 mph along with a .090 reaction time. Mark Krumanaker (Muncie) was the winner with an 11.24-second run against an 11.16 dial-in, paired with a .031 reaction time. Lindsay Sarauer (Great Lakes) made a 9.84-second pass against a 9.72 dial-in with a .029 reaction time. Friday's Gambler's Race Top - Steve Riggins (Muncie) 7.06 on a 7.03 dial-in, .040 reaction time defeated Todd Strefling (Osecola), 4.94 on a 4.95 dial-in, .050 reaction time. Mod - Stan Jones Jr. (US 131) 5.97 on a 5.99 dial-in, -.005 reaction time defeated Nathan Schroeder (Cordova) 6.06 on a 6.07 dial-in, -.009 reaction time. Junior - Mason Osborne (Great Lakes) 8.09 on an 7.97 dial-in, .021 reaction time defeated Peyton Gortney (Osecola) 7.93 on a 7.92 dial-in, -.082 reaction time. Top - Lane Ledford of Stanton, Mich., 8.36 on a 4.87 dial-in, .029 reaction time defeated Jace Deering of Clinton, Iowa 6.85 on a 6.85 dial-in, -.003 reaction time. Mod - Jordan Wilhelm of Delphos, Ohio 6.77on a 6.76 dial-in, .001 reaction time defeated Donnie Hagar of Clark Lake, Mich., 6.42 on a 6.41 dial-in, .032 reaction time. Junior - Kenzie Lieferman of Comanche, Iowa 7.99 on an 8.00 dial-in, .206 reaction time defeated Tyler Howard of Battle Creek, Mich., 8.91 on an 8.90 dial-in, -.101 reaction time.